Buy Sunita Organic Honey Halva with Almonds - 75g in the UK from our online shop or directly from our independent Scottish store. Sunita organic Greek honey halva infused with crisp organic almonds has a unique crumbly texture and delicious flavours. Where can you buy real Organic Halva + Almonds safely online? If you are wondering where you can buy Sunita Organic Honey Halva with Almonds - 75g safely online in the UK, then shop with us. 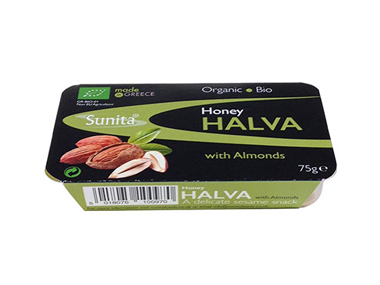 Organic Halva + Almonds - Sunita Organic Honey Halva with Almonds - 75g in Sweets and Confectionery.